The Superior Upland of Wisconsin (and adjacent Minnesota) is a large surface exposure of the ancient (2.6 to 1.6 billion years old) core of the North American continent, known geologically as the Canadian Shield. In the present age, this is an area of low topographic relief. However, these metamorphic rocks once formed mountains located at the margin of a continent. Some of these highly altered rocks have been important sources of iron, copper, and other industrial minerals. Much of the northern two-thirds of Bayfield County are underlain by sedimentary rocks consisting of sandstone, shale, and conglomerate. Granite, gneiss, greenstone and quartzite underlie the extreme southeastern part of the County, continuing the band from Iron and Ashland Counties. Part of the County is underlain with Superior Red Sandstone covered by a thick mantle of clay and gravel forming an artesian slope. The Superior Coastal Plain is Wisconsin’s northernmost Ecological Landscape and in Bayfield County, this ecological landscape is restricted along the Lake Superior coastal plain. The major landform in this Ecological Landscape is a nearly level plain of lacustrine clays that slopes gently northward toward Lake Superior. The Bayfield Peninsula separates the clay plain into two disjunctive segments. The Apostle Islands, an archipelago of sandstone-cored land forms, are located just north and east of the Bayfield Peninsula. 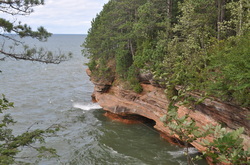 Sandstone cliffs, carved out by the wave action of Lake Superior, bracket stretches of the Peninsula, also occurring along the margins of several of the islands. Sand spits are a “striking feature” of the Lake Superior shoreline. The sand pits typically separate the waters of the lake from inland lagoons and wetlands and support rare and highly threatened natural communities such as beaches, dunes, interdunal wetlands, and pine barrens, and many specially-adapted plants and animals found within these habitats. A ridge of volcanic igneous rock, primarily basalt, forms the southern boundary of portions of this Ecological Landscape. The mouths of many of the streams entering Lake Superior are submerged, creating freshwater estuaries.